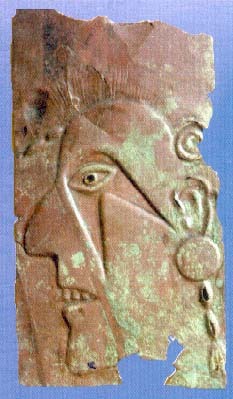 About 800 AD, the old Hopewell people seem to have developed what we call the Mississippian culture. People living near the Mississippi river got new kinds of corn about this time. Now, instead of just building burial mounds, people built mounds with flat tops and built buildings on top of the mounds, like a Mayan temple. Some of these buildings were temples for the gods, and others were for rich, powerful families to live in. They lived in bigger towns, instead of small villages, and these towns also started to look more like Mayan towns. They ate a lot of fish, and they farmed corn. They raised turkeys. On the other hand, people seem to have lost interest in building big burial mounds. These Mississippian people were powerful. 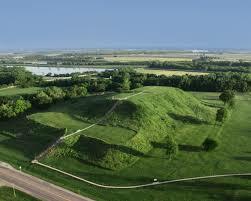 They took over a lot of the land near them, and built more towns with more mounds and temples. When they were at their most powerful, about 1200 to 1500 AD, they controlled land from Wisconsin to Tennessee and Florida. They got copper from Wisconsin, shells from Louisiana, chert from Oklahoma, and mica from North and South Carolina. Like the Romans a little earlier, they controlled salt mines near their towns. But in the Late Mississippian period, beginning about 1400 AD, people seem to have been fighting a lot of wars with each other. Some towns were abandoned, and others built fortification walls. This might have been because of the climate cooling that happened around 1300-1400 AD, which also changed the lives of the Pueblo people to the west. This was the situation when Spanish invaders first landed in Florida just after 1500 AD. Cite this page: Carr, K.E. Mississippi People – Native Americans. Quatr.us Study Guides, August 9, 2017. Web. April 20, 2019.